Once our brightly colored nested set of Preserve Mixing Bowls joins your household, it will be difficult to imagine life without it. The easy-to-grip handles and funnel spouts make stirring, mashing and pouring a snap. 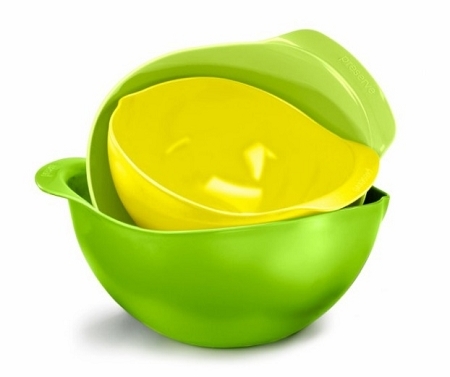 And because the bowls are made of heavy-duty recycled #5 plastic, they not only stay steady on the countertop, but also can handle thousands of washings. 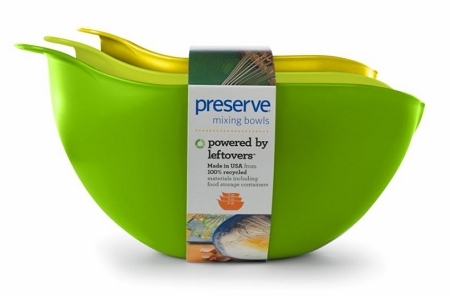 The bowls can also double as great serving containers, easily transitioning from kitchen to table. Let's face it, mixing bowls aren't that exciting--not a lot of flash and pizazz. 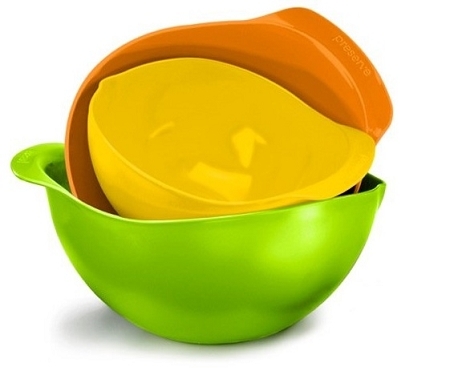 These mixing bowls however, with their 3 bright colors, are an exception. Your friends will definitely take notice. As with other Preserve products, very well made. As I discovered, great for making and eating a salad too. Mini grip lip aids in serving. Top notch.